I’ll be at a customer site in Holland early next week, deploying quite a bit of PowerDNS authoritative server version 3.2, which which has just been released. INCEPTION-EPOCH is a bit special: it sets the new SOA serial number to the maximum of the old SOA serial number, and age in seconds of the start of the current signing period. Let’s see an example based on typical SOA serial numbers. The following query obtains the SOA record of a zone. The first number (1) is the serial number as added to the database. I’ve taken the liberty of emphasising the methods I believe are safest in terms of producing a different outgoing SOA serial number when it’s modified in the database. 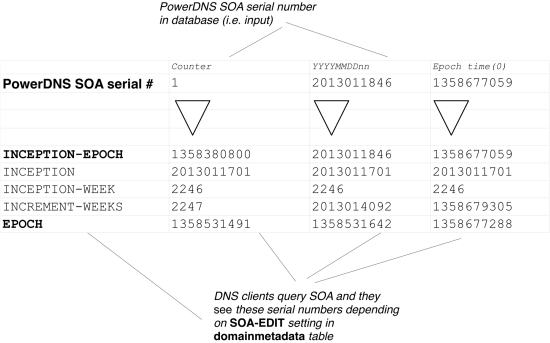 Remember, that it is important to increment a serial number when a DNS server is operating as a master server, so that its slaves will (by querying the SOA record) be able to determine that the zone content has changed and will thus re-transfer it. Some of this is also contained in my DNSSEC reference card, which you might enjoy.